Behind the Scenes "Kansas City Voyage Film Shoot"
Which of George's songs from It's Entertainment do 你 like best? What is your 最喜爱的 song that George sings on the new Celtic Thunder 圣诞节 album? Which ballads do 你 wish George to sing? Do 你 totally 爱情 George's new song "500 Miles"? 粉丝选择: Yes - It rocks! Hello Thunderheads! It's that time again where I'm begining to think a change in scenery on this spot would be nice. As always, I'm going to need some help, so post your 图标 suggestions here! 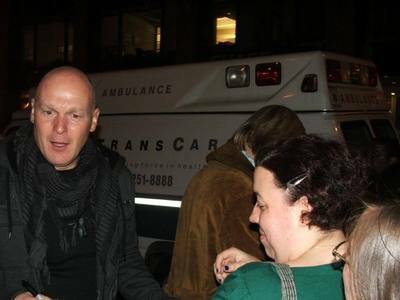 George, thanks for being that sweet, heartwarming Scottish man in Celtic thunder! You're our celebrity father! Here's reflecting on the past few years- just some funny things, sweet things, and just all around great things about you! Overture and beginners please... Strike up the band... Stand 由 for Celtic Thunder... and "It's Entertainment." This stylish and high energy trip through some of the great songs of the last 30years is pure showbiz! It is a tribute from Celtic Thunder to the legacy they have inherited from the great entertainers of the past, and a mark of how far they themselves have travelled as performers, in a few short years. Corretion . . ."My Fine Scottish/Irish Gents". . .
a comment was made to the poll: Which of George's songs from It's Entertainment do 你 like best? What is George's 最喜爱的 book?